I begin this morning, by describing for you a painting by the 20th century French Surrealist painter, Rene Magritte. The painting is not hard to describe. It is a pipe – not a lead pipe, mind you, but the kind of pipe that one would use to smoke tobacco. The simple brown pipe sits squarely in the middle of the canvas, all by itself against a tan background. It is quite an elegant, lovely object. It’s like you are having an argument with the painting. Or isn’t it a pipe? If this pipe, not a pipe business has you confused, consider this story from the Buddhist tradition. But the Buddha said, wait a second. You are approaching the whole thing in the wrong way. The teaching, is not the truth. Just like the finger, pointing at the moon is not the moon. If you think the finger pointing at the moon, is the moon, you are missing the whole point. The pipe thing is the same. No matter how much our brains want it to be a pipe… it is not a pipe. If Magritte had a craving to smoke some tobacco, he could not use his painting for that purpose. Because, of course, Magritte’s painting is not a pipe. It is a painting of a pipe. And the representation of the thing. And the finger pointing at the moon. And as odd as it may seem, we often get the two confused. A problem of immense proportions. You don’t have to go far to see this problem at work in our lives. The church, for example, struggles a great deal with it. The church has one role – to create community around the love and worship of God. then very bad things happen. Because, in each case, people confused religion with God. Religion, my dear friends, is not the same as God. Religion is a set of human traditions and practices that attempt to point to God. In their potential for beauty and their potential for hypocrisy, religion presents itself as the most human of constructs. but it is not God. Every once in a while, someone comes along who is, for whatever reason, the right person, in that moment, to help us see, with unmistakable clarity, what really matters. By “what really matters” I mean – the thing itself. Not the painting of the pipe, but the pipe. Not the finger pointing at the moon, but the moon. I would like to talk about two such people, this morning – one of them is someone that I talk about every Sunday. It was not an idle warning. Herod Antipas, like his father, Herod the Great , was perfectly willing to order extra-judicial killings of people he considered a threat. John the Baptist, in fact, was one of his recent victims. And Jesus, who was drawing large crowds, and performing miracles in Galilee, must have known that it would not be long before Herod would come after him. “Go and tell that fox for me, ‘Listen, I am casting out demons and performing cures today and tomorrow, and on the third day I finish my work. Jesus dismisses the Pharisees with little apparent concern. It’s not that he doesn’t believe them, or thinks their concern is overblown. Jesus knows Herod Antipas well enough to know that he, Jesus, is in real danger. Jesus dismisses the threat because, while it may be a very real threat, to him, it is not the thing itself. Jesus has his eye on the thing itself, and this business with Herod is just another distraction. For Jesus, the thing itself, is the enactment of his “always for others” destiny. For Jesus, the thing itself, is an immediate responsibility. He will not put it off until next week. He will do it “today and tomorrow,” whether Herod likes it or not. On August 20th of last year, a 15-year-old Swedish girl skipped school. 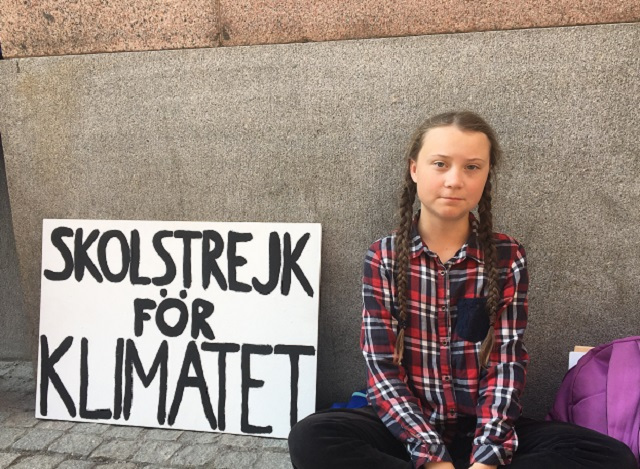 Instead of going to school, Greta Thunberg went, with the permission of parents, and stood outside of the Swedish Parliament building in Stockholm. So began “Fridays For Future” a viral movement of school children who strike from school on Fridays to demand legislative action on climate change issues. The movement of young people has been growing steadily, and exponentially since that August day. An estimated number of more than a million people in 125 countries demonstrated at about 2000 events worldwide. When Greta was 11 years old she was told about climate change. Unlike other’s she could not accept this reality. She fell into a deep depression, stopped talking, and lost a huge amount of weight. For those of us who are on the spectrum, Greta said in a Ted Talk, almost everything is black or white. We aren’t very good at lying, and we usually don’t enjoy participating in this social game that the rest of you seem so fond of. On the autism spectrum, this young woman is immune to the distractions – cell phones and clothes and social media – that have distracted her peers. She has no difficulty looking past the pointing finger to see the moon. She sees the thing itself. And she is not intimidated by the system, because the system (like Herod’s threat) is of no real consequence beside the urgency of the thing itself. …not mature enough to tell it like is. Even that burden you leave to us children. But I don’t care about being popular. I care about climate justice and the living planet. And like Jesus, Greta knows that the thing itself requires immediate attention. Climate change is not a theoretical idea anymore. To make the change necessary to sustain a livable planet. Greta, like Jesus before her, is a prophet. But in the sense that she avoids the finger pointing to the moon, and concentrates on the moon itself. Prophets get us to the thing itself. Listen to the children… they are speaking the truth.